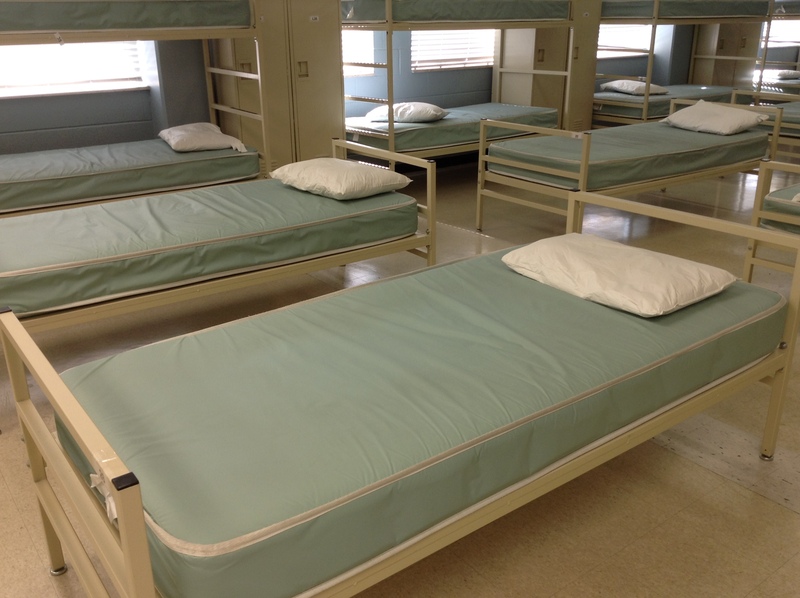 Although the vision in London and across Canada is to end homelessness, emergency shelters continue to play a key role within the system as it stands. They serve as a ‘sure thing’, a landing spot for people as they encounter crisis, or a short (or unfortunately longish) term solution for those with more complex challenges. When options run out, people are able to access shelter on short notice and be assured of having their basic needs met for at least a brief period of time. In fact, the future ideal state still includes emergency shelters as part of a comprehensive system. 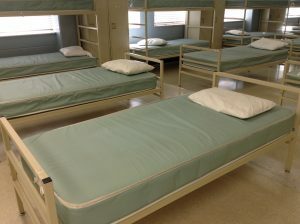 This is because people will still encounter crises and will need a place to go to connect with the system and be supported into new permanent housing. However, what will change will be the length of stay in shelters and the services received, with very short stays and intensive services to ensure quick exit to appropriate housing. This is obviously good news. This means that to some degree we are doing a better job at preventing homelessness in the first place, or keeping people housed once they have been re-housed. The majority of these shelter users stay one night, meaning that we are also doing a good job in helping people find permanent housing options. 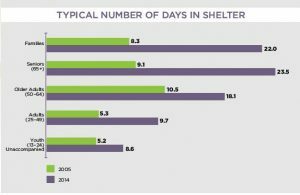 This means that counter to the efforts of Housing First, meaning rapid rehousing of those who use shelter the most, chronicity is increasing. I would be curious to see whether there are regional trends to these numbers and if communities with extremely low or negative vacancy rates (such as Toronto and Vancouver) are skewing the numbers. 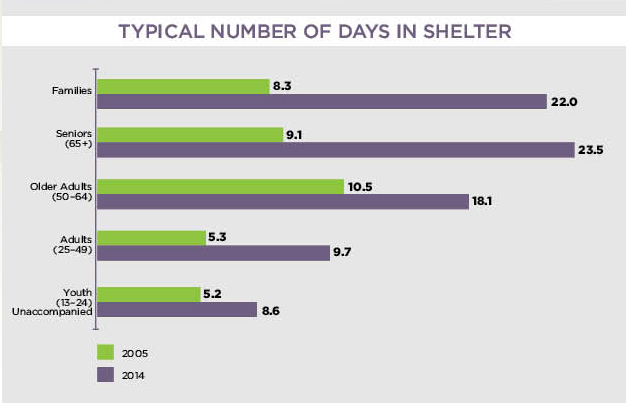 However, this speaks clearly to a greater need for affordable housing options to support people in exiting shelter. 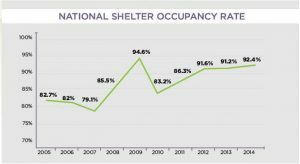 This creates a challenge for government: Do you build more shelters to respond to occupancy demands at the same time that you are trying to provide more permanent housing options to reduce shelter use? Interestingly the same parallel exists in housing for frail seniors, where there is demand for more long-term care facilities while the ideal is that more people are supported to age at home. Do you respond to the immediate need if it may counter the long-term ideal state? My response would be to specify the focus and look community-to-community and population-to-population. 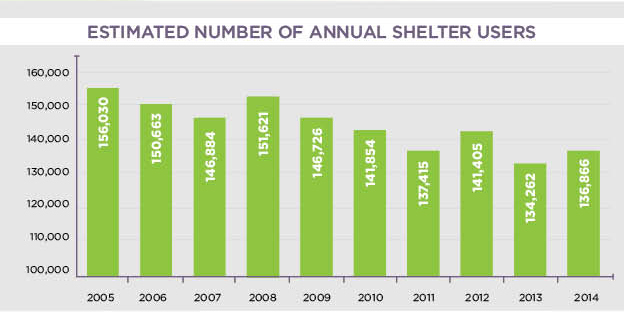 For example, a community may have overall sufficient shelter capacity by the stats, but insufficient for a particular population such as LGBTQ or single women. Or, a whole province might average sufficient capacity yet one urban area might have a significant need. Therefore, I think we hold the vision of reducing emergency shelters in general, while perhaps increasing capacity in specific areas for specific populations. In conclusion, I see both good news and bad news in the stats. However, I think the message is clear that we still need more affordable, permanent, and safe housing options to move people from shelter to home, and the rights supports to make this successful.